September 4,2016 The 46th annual Barona Powwow continues today at the Barona sports park, located on the Barona reservation in Lakeside. View our video (top left) of Saturday night’s grand entry procession featuring NativeAmerican dancers in full regalia from tribes across the nation, and a second video (below) of a victory song honoring all warriors including our military and veterans. The 46th annual Barona Powwow will take place September 2nd -4th at the Barona sports park, located on the Barona reservation in Lakeside just north of the Barona Casino and Resort. Powwows aim to preserve Native American cultural traditions for future generations. Barona’s powwow attracts tribal dancers and drummers from across the nation, as they compete for prizes. (Admission for spectators is free). You can also shop for Native American arts and craft items at vendor booths, and purchase food such as Indian fry bread. July 24, 2016 (Barona) — A rotary motor, or brush hog, struck a rock and sparked a brush fire that charred 133 acres last Monday, Cal Fire reports. UPDATE AS OF 2:24 PM: Fire 90% contained, lawn mower believed to be cause of blaze. UPDATE AS OF 9:47 AM July 19: Fire 65% contained, still at 133 acres. UPDATE AS OF 8:48 P.M.: Fire 50% contained, still at 133 acres. July 18, 2016 (Barona) - A fast moving brush fire east of the Barona Reservation started at around 14:00 hours, and has a rapid rate of spread. Residents on or around Feather Canyon Road are under evacuation orders, with Sheriff's officers carrying out those contacts. As of 17:00 hours, the evacuation order has been lifted and the acreage has been updated to 133 after more thorough mapping. The fire is still holding. Crews are on scene. Large animals can be taken to Equestrian Center at 16911 Gunn Stage Road in Ramona. 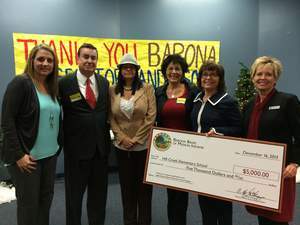 November 9, 2015 (Lakeside)-- Lindo Park Elementary School, a K-5 school that has served the Lakeside community for over 60 years, received a $5,000 education grant earlier today from the Barona Band of Mission Indians. The Lakeside school teaches students to excel in a global society by integrating a research-based curriculum in a 21st century environment. The grant, which was sponsored by Assemblyman Brian Jones, will be used to purchase Life, Earth and Physical Science materials for the school’s fourth and fifth grade science laboratories. September 2, 2015 (Lakeside) – In an interview with the East County Magazine on KNSJ, Barona tribal council member Beth Glasco shared insights into the 45th annual Barona Powwow set for this weekend. A powwow dancer herself, she discusses the history and origin of the Barona Powwow , as well as its cultural significance for her own family and for Native American tribal members who convene from across the nation to celebrate their heritage. The 45th Annual Barona Powwow begins on Friday, September 4 and ends Sunday, September 6. The three-day celebration held at the Barona Sports Park starts on Friday, September 4 with Gourd Dancing at 6 p.m. and the spectacular Grand Entry at 7 p.m. and continues throughout the weekend on Saturday and Sunday from 1 p.m. to 11 p.m. Admission is free. Update June 19, 2015 5 p.m. -- The fire is 170 acres and is now 68% contained, Cal Fire advises. Update June 18, 2015 12 p.m. -- A firefighter has been injured, NBC news reports, as firefighters continue holding the blaze in rugged terrain. Update June 18, 2015 8 a.m. -- Cal-Fire now estimates the fire is at 178 acres and 38% contained. Firefighters worked through the night with headlamps in steep terrain. Wildcat Canyon Road is open in both directions and homes are no longer threatened at this time. Update 9 p.m. -- The fire has burned 150 acres and is 10% contained. Temperature is 75 degrees and humidity is 54%; the rate of spread is now slow. Hundreds of firefighters are battling the blaze including Cal-Fire, the U.S. Forest Service, Heartland and Barona. Wildcat Canyon Rd. remains closed from Founder's Way to San Vicente Road, Cal-Fire advises. The County Office of Emergency Services and the American Red Cross are also now involved. Update 6:45 p.m. - Cal Fire spokesman Kendal Bortisser has advised that the fire has potential for 500 acres, though Cal Fire hopes to contain it at 50 acres. Fire is 10% contained, incident commander estimates. Residents report heavy smoke and poor air quality. The Sheriff has evacuated 7 homes but no others are currently threatened. Those evacuated are sheltering at the Barona Casino. View live-streaming video on Fox 5 at http://fox5sandiego.com/on-air/live-streaming/. June 17, 2015 (Lakeside) - A brush fire is burning in Lakeside early this evening on the Barona reservation near Wildcat Canyon Road. The fire, reported about 4:50 p.m. near Acuunya Way., is northeast of the casino and moving northeast toward a glider port. Cal Fire estimateed the blaze at 20 acres but a retired fire official in the area has estimated that the fire has swelled to 40 or 50 acres. Structures are immediately threatened and the blaze is spreading rapidly, according to Cal-Fire. Wildcat Canyon Road is closed due to the fire from San Vicente Road to just south of the casino. Fixed wing aircraft and helicopters are battling the fire, ECM news partner 10 News reports. Multiple news outlets report the Sheriff has evacuated several residences in the Acuuunya Way area. January 23, 2015 (Lakeside) – Elaina Rose Welch, who was arrested following the deaths of her child and boyfriend on the Barona reservation last week, was released from jail Thursday. Tribal police responded to a call about an attempted suicide and the Sheriff’s department responded to a call reporting her baby was dead. The police spoke to a man, now known to be her boyfriend, Julio Ricardo Monggiotti; who then entered the home and a shot was heard. Welch exited the home and dropped a shotgun on the road. January 17, 2015 (Lakeside) – The man fatally shot yesterday in a double homicide on the Barona reservation in Lakeside Friday has been identified as Julio Ricardo Monggiotti, 32. The identity of a child also found dead will not be released until after an autopsy scheduled later in the week, according to the Sheriff’s office. Elaine Welch, 32, has been arrested for the killings. 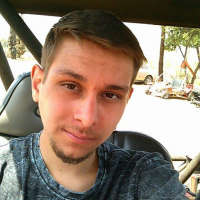 According to his Facebook page, Monggiotti worked at Mr. Paintball USA , formerly served in the U.S. Army and was a student at San Diego State University. A graduate of Eastlake High School, he was originally from Chula Vista and later lived in San Diego. January 16, 2015 (Lakeside) 2 p.m. – A SWAT team stand-off at Barona following a reported shooting has shut down a section of San Vicente Road. There is a heavy law enforcement presence; avoid the area until further notice, the Sheriff advises. A woman is in custody but the situation is ongoing, reports 10 News, which has a news crew en route to the scene. Tribal police and the Sheriff’s Department are responding. March 16, 2014 (Barona) – Graciela Bustos, 53, of Ramona died at a local hospital of injuries sustained earlier in the evening on March 15 in a head-on collision. The crash occurred at 6:37 p.m. on Wildcat Canyon Road on the Barona reservation. The vehicle that swerved over the center line and caused the deadly crash was reportedly driven by a Barona tribal enforcement officer who was on duty at the time, a Cal Fire official told the Ramona Sentinel. Bustos was a passenger and was wearing a seatbelt, the Medical Examiner reports. The driver of the vehicle carrying Bustos was seriously injured, sustaining injuries to his face, arm, leg and hip, according to the Ramona Sentinel. January 15, 2014 (Lakeside) – If you’re looking for a place to getaway from the hustle and bustle of city living without traveling far away, consider a stay at one of San Diego County’s local Native American resorts. Recently, I won a vacation to Barona Resort & Casino in a prize drawing at the La Mesa Centennial party –so in early January, my husband and I savored a relaxing weekend at Barona. Unlike Las Vegas casinos, Barona resort is not glitzy or gaudy. The casino and hotel complex are designed to fit in with the rural ambience, complete with a casino designed to resemble a barn and a waterwheel. The property includes several lakes, providing idyllic places for walking or relaxing in an Adirondack chair to watch the sunset over the nearby mountains. The site is also designated as a migratory bird sanctuary by the Audobon Society. November 22, 2013 (Lakeside)– Barona Resort & Casino has joined in relief efforts to help those affected by the devastation of Typhoon Haiyan. Barona presented a $10,000 donation to the Philippine American Business Improvement and Development during the organization’s annual gala. Barona will also continue to support those affected by Typhoon Haiyan with another $10,000 cash donation and a three-week, casino-wide fundraiser that will benefit relief efforts through the American Red Cross. The casino-wide fundraiser begins on Saturday, November 23 as Filipino politician and boxing legend Manny “Pac-Man” Pacquiao takes on Brandon “Bam Bam” Rios in a pay-per-view fight which will be shown at the casino. From November 23 through December 15, Barona will match, dollar-for-dollar, the price of each Filipino-inspired entrée purchased at Ho Wan Noodle Shop. Players and staff will also have an opportunity to make a donation in designated collection boxes throughout the casino and everyone who makes a donation will be given a special thank-you button for their support. August 10, 2012 (San Diego’s East County)--The San Diego Stars semipro baseball team has been invited to participate in the Grand Forks International Baseball Classic in British Columbia, Canada, to be held over Labor Day weekend. December 28, 2011 (Lakeside) – A motorcyclist down in the 11400 block of Wildcat Canyon Road has prompted shutdown of the highway. The accident was reported at 3:27 p.m. Traffic is blocked south of Barona, CHP reports. November 16, 2011 (Lakeside)--On November 19, the Barona Cultural Center & Museum will open “Rock of Ages: Contemporary Music Traditions on the Barona Reservation” -- an exhibition that will showcase today’s native culture of singer-songwriters, rock bands, country-western players and other popular music, reservation-style. September 29, 2011 (Lakeside) -- A 1-acre brush fire with potential to reach 10 acres is burning at the Barona Golf Course, 1932 Barona Road in Lakeside, Incident Page Network reported at 3 p.m. Watch for updates.